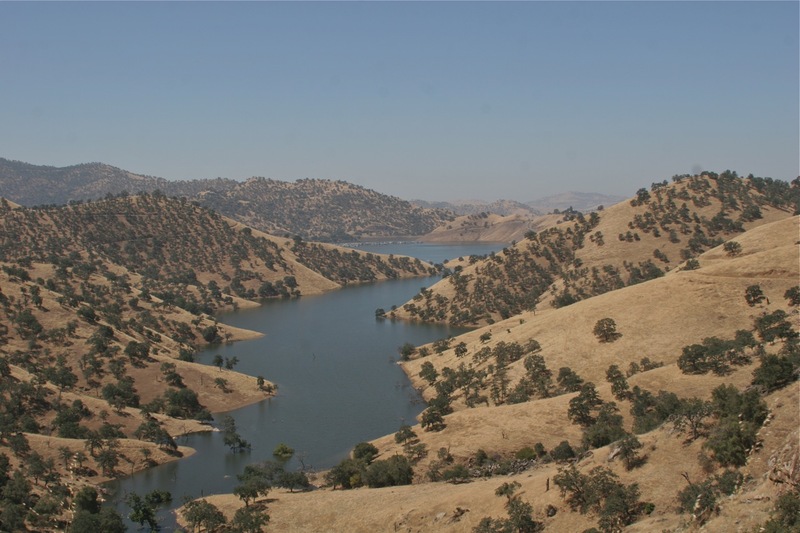 Lake Kaweah, behind Terminus Dam, has only 4-5 more feet to go to get to the reservoir’s high-water mark. The river peaked at about 5,600 cfs for an hour on June 16th, but for 24 hours, cumulatively, June 22nd recorded the highest flow amid four 100º days. Currently about 2,200 cfs inflow to Lake Kaweah, 2,100 cfs outflow. Dry Creek has dropped to 14 cfs, but a lot of water yet for this time of year. 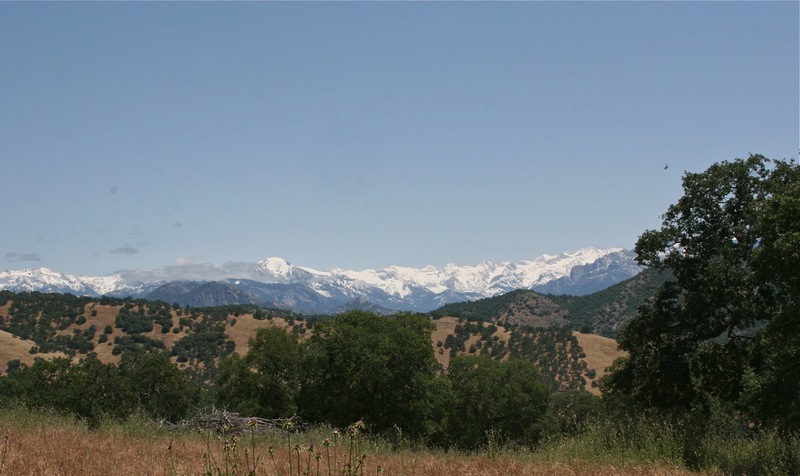 Yesterday, our first 100º day of year, brought snowmelt out of the Kaweah watershed last night with the river peaking almost 5,600 cfs. Meanwhile, this week’s warming trend has reduced Dry Creek’s flow from 30 cfs to 23 cfs, a lower watershed with snowmelt gone. 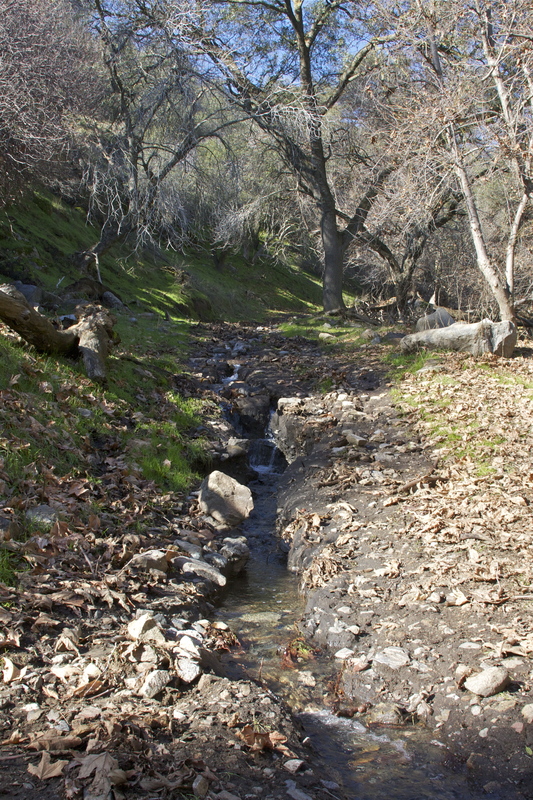 Dry Creek’s mini-watersheds that contribute to its flow are drying back with the heat and longer days. Still a few wet spots and bogs around the ranch, some roads still impassable, we have experienced two wet years in a row, unheard of in my lifetime. Delightful, but unseasonable weather as we wean calves. 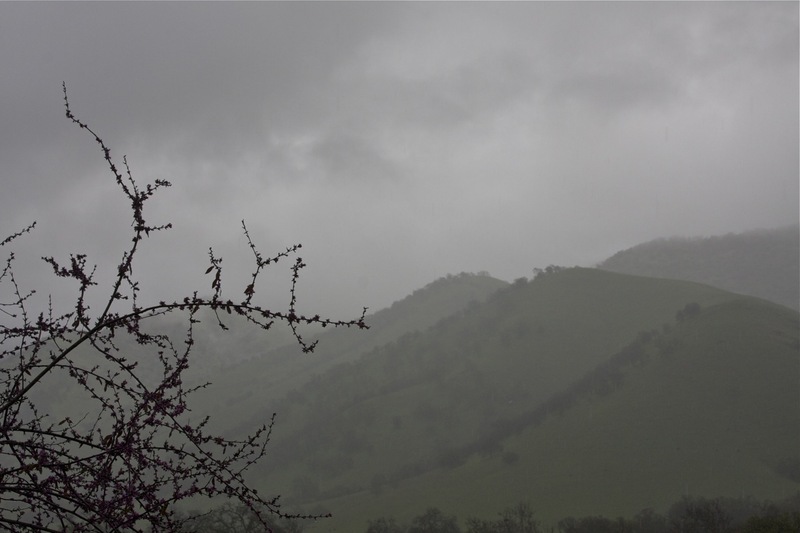 48º degrees at daylight, .12” rain, a blanket of heavy gray clouds hangs along the foothills at 2,500 feet. Winds gusty last night as the front moved east, temperatures forecast in the 70s through Friday with another chance of rain on Sunday. The forecast will change – I suspect there are not any computer models that encompass current conditions for this time of year. Gathering has been tougher with ample feed and water everywhere. It’s not as simple as gathering to stockwater ponds and springs as the water is still seeping in every draw, some places impassable for any kind of vehicle. Additionally, there’s still green feed, lots of clover yet. Cows and calves are fat! 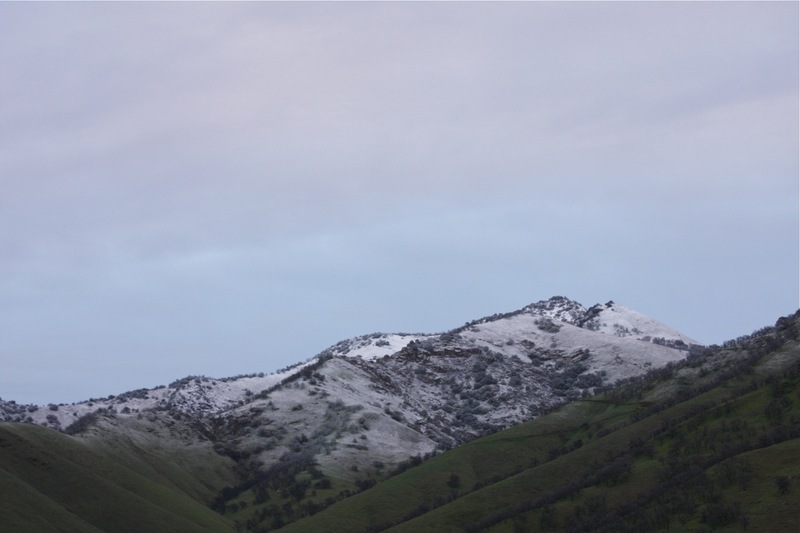 Plans to locate a dozen heifers with the Kubota this morning, missing in our gather around Lake Kaweah, have been postponed, as their suspected location is in the clouds – perhaps this afternoon when their tracks will be fresh. We’d also planned to reacquaint ourselves with the cows and calves we’re gathering on Monday to wean. We’re on schedule, so if we loose a day to rain in May, it’s OK. Either way, we’re going to enjoy these rare weather conditions! 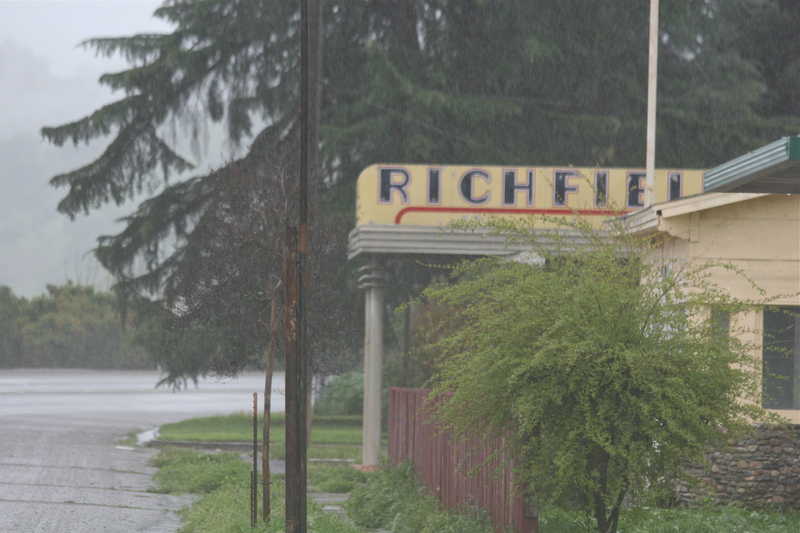 May 16, 2011 – Leaving Elko – portion of an email to Meg Glaser with nothing else to journal. The windsock didn’t dance much, stared straight at us while we waited for a light Cessna to inch off the runway, hesitant to turn across the wind for fear of flipping over. Young, burly miner next to me got whiter, gripping the seat-back in front of him with both hands, sweating profusely as our derrieres tried to catch up with our asses, plane sliding side-to side as we lifted through the clouds. But bolstered by Pat’s (Sullivan) confidence, I joked and laughed through it to relax the miner who introduced himself as ‘I Don’t Fly Well’. I’m sure he was praying to his gods – but one of those situations where too much of the same karma might have scared us all to death. Damn-sure bumpy! Thought of calling Robbin in SLC, but having to cross back over the storm front to Fresno, I didn’t want to worry her. Home by 5:30 p.m. Pretty easy for a guy who doesn’t really like to fly either. .25″ rain here yesterday a.m.
High temperatures in the mid-80s have plunged into the mid-60s since Sunday, gusty winds, clouds and light showers. Forecast: warming trend, showers return by the weekend. We hope this unseasonable weather does not manifest itself as continued disasters in the East. 39° this a.m. The last half of April has been cool, a few days over 80º, but most in the mid-70s with partially cloudy days as the jet stream has held steady over California. The foothill green feed has begun to turn on the south and west slopes while higher elevations hold well and are still damp to boggy in places with our season’s rainfall total now in excess of 24”. Idyllic weather for cattle and people! Dry Creek is running strong at 55 cfs, and now low enough to repair watergaps before weaning and shipping. 2-3 weeks later than normal, we’ve begun irrigating the pasture, which is tall and will need mowing before turning the weaned calves in. Native feed is stirrup-high in the flats, wild oats nearly tall enough to dally. Native feed quality includes lots of filaree, Strawberry, Bur and Tomcat clovers and very little junk grass. Few wildflowers show this spring, unable to compete with ideal conditions for native feed. Though we haven’t weighed any calves yet, they’ve done well, perhaps heavier than last year, if possible. Weather patterns continue extreme in other areas of North America, especially the south and southeast with record-breaking tornado activity, winds and fires in Texas and New Mexico. We have accumulated nearly 4.5″ in the past week with showers today and rain Saturday (26th) predicted. 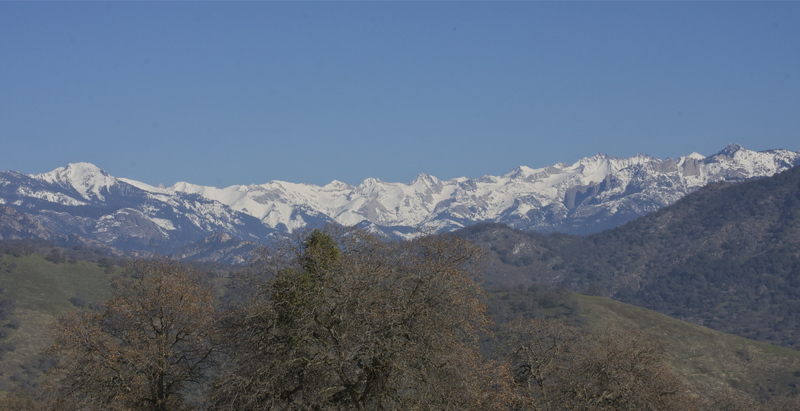 The ground is saturated, the creek up (1,700 cfs) and muddy, snow stacking over 50 feet in places in the Sierras that has yet to come down, that will come down when the weather warms. March appears to end with below average temperatures (low 70s), wildflowers waiting. If April is also cool, May, when one can always depend on some 100 degree days, could very well be a flood month. Things are shaping-up wet, regardless. Thank God for the Weather! I have my desk to clean-up that after tax accounting, endless mail and disheveled stacks of books that looks like a junk yard – stuff I know is there, somewhere, but I can’t possibly find. Plenty to do as we await T-storms this afternoon that threaten the Valley’s deciduous fruit and nut trees in bloom – peaches, plums, nectarines and almonds especially vulnerable. Obviously the planet’s in revolt, reacting to something big. Our hillsides are oozing, moving with the weight of water, I suspect – nothing to do but wait, because we’ve seen nothing yet. 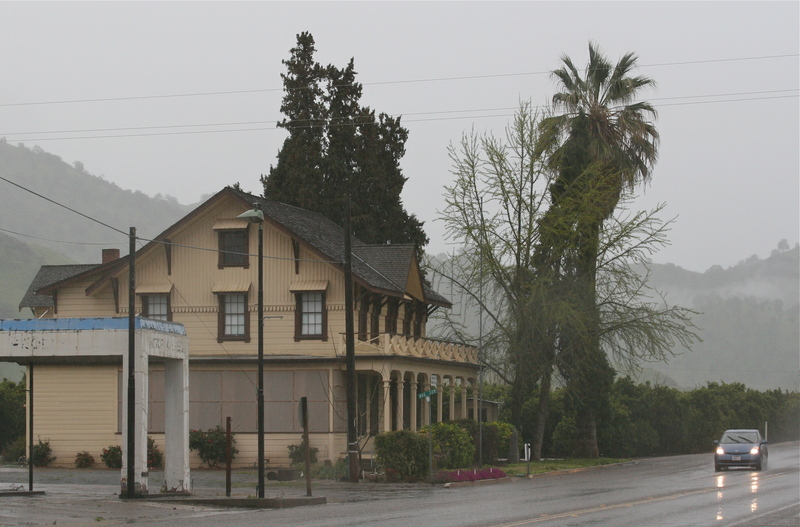 After another all-night rain, the creek is up and snow low enough to close the Grapevine, the Interstate between the San Joaquin Valley and L.A., and Deadwood, the steep and curvy stretch falling-off into Oakhurst where Robbin’s brother operates a snowplow for Cal-Trans. Also Priest Valley, CA 198 & 25 west of Coalinga in the Coast Range is closed. No surprise that a chunk of Highway 1 through Big Sur lies in the Pacific. 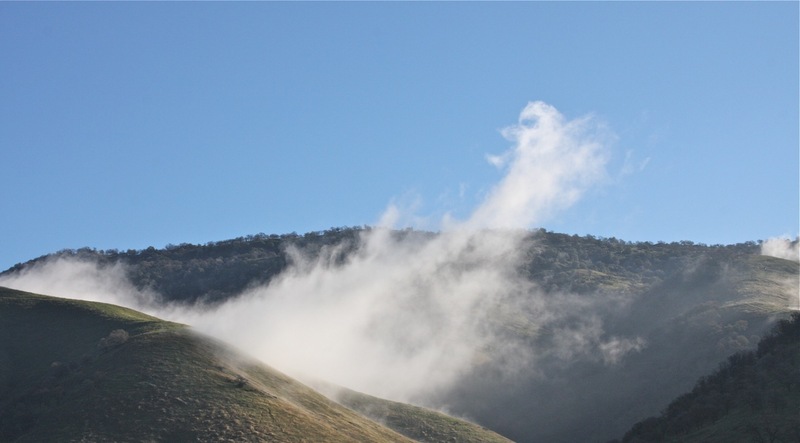 1.68 inches of rain in the past 24 hours, 2.22 inches in the last 3 days, and still raining, clouds hanging below Sulphur Peak at 3,000 feet, our ground has not dried out since the middle of last December and more rain forecast for the next ten days. Gray, we’re sequestered inside once again as the late-month pattern repeats itself, the garden half-tilled with implements waiting, standing, planted ready in wet soil. Weeds on the periphery are making a comeback where I sprayed a few months ago. Getting off the asphalt, Dry Creek Road, with a pickup is a non-productive option, and crossing the muddy creek I can see from my desk this morning would be foolhardy. Getting Kenny and Virginia’s calves branded Friday instead of Saturday looks like genius now, and apparently their ‘bulls too big to brand’ and hauled to town instead brought good money. We’ve got damn little to complain about and thrilled to have something other than world politics to discuss. We appear to be moving into another wet cycle established in the last half of November, a hint of which appeared in October, but really manifested from December 15th to January 4th, with nearly 13 inches accumulated – a 30-day cycle reaffirmed again in January and February. It’s unusual for these cycles to go beyond 90 days before a another 30-day cycle is established, usually a dry cyclical pattern injected between fall and spring. With some warm days in February, March appears to remain much cooler than normal. 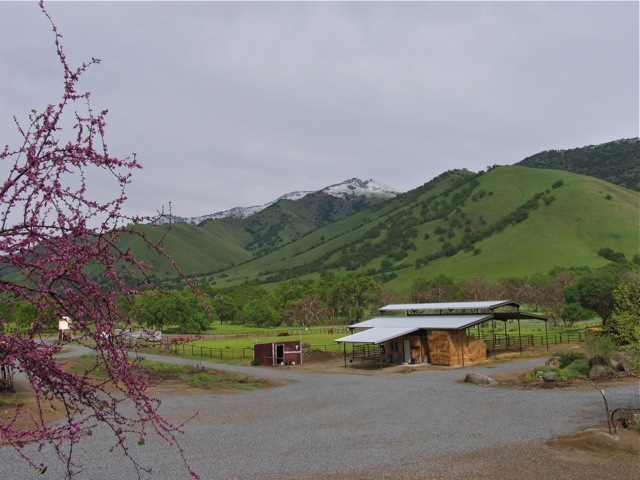 The grass is slow growing at the higher elevations – but a lovely spring despite wildflowers yet to come. 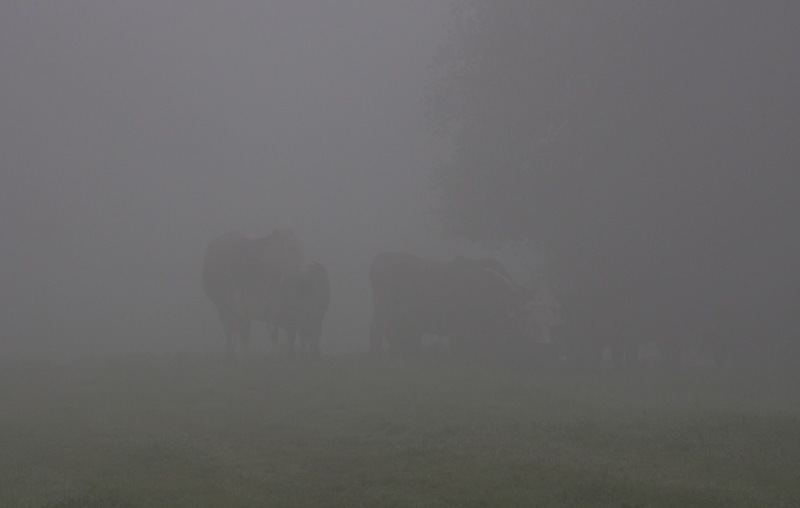 Robbin & I left yesterday morning with salt and mineral to look at the cattle in Greasy. We took our cameras hoping to get some early spring photographs, but ran into some cold, low clouds and fog instead. Visibility here in Section 17 was about 100 yards. It’s early morning dark, 48 degrees, the stars eclipsed by a tenacious, high fog as the tree frogs sing in a rivulet beside the house, from the hillside leaking last month’s rain. We branded calves yesterday at Tony Rabb’s and head up the hill this morning to mark a little bunch of our own. 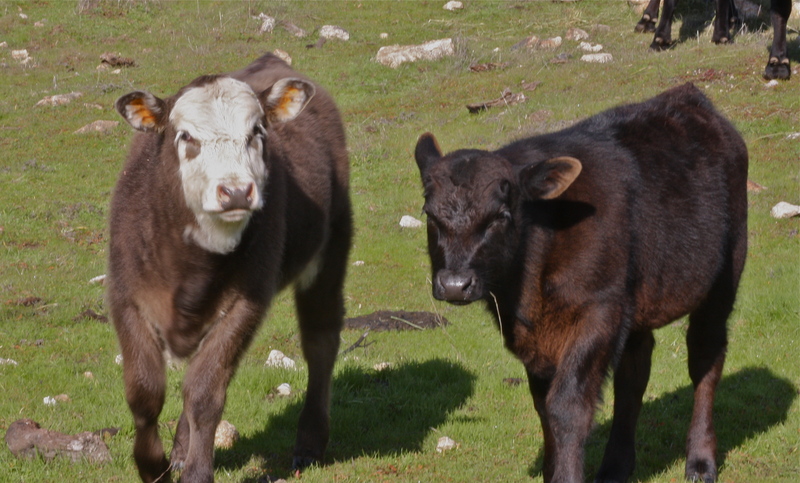 Our community of foothill ranches is branding madly, two or three, it seems, everyday, as good help gets thin. Though the company of the little frogs croaking is pleasant, almost exhilarating, it sounds a bit too early for spring. All the more reason to get to work, when and where we can. 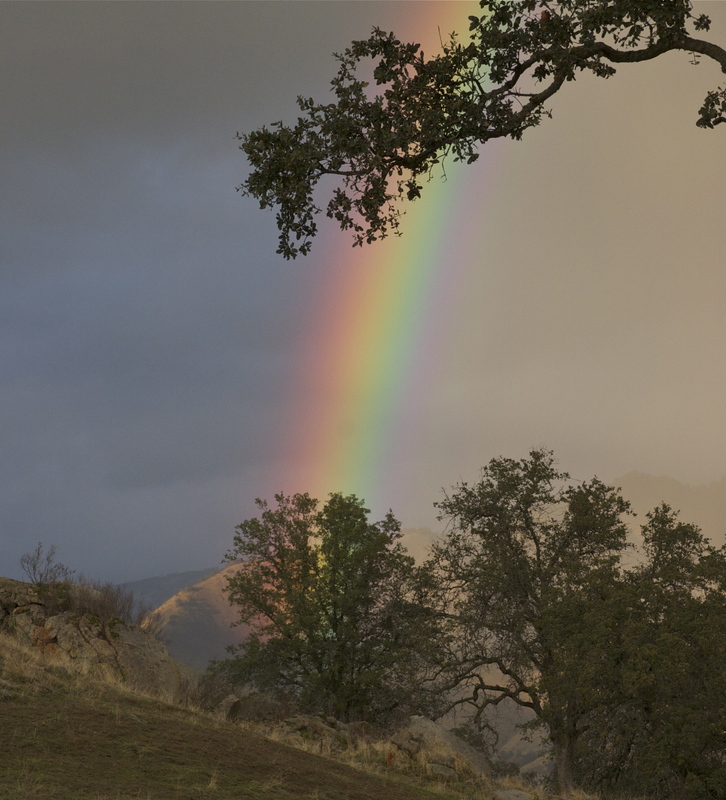 The gray fog and low clouds clinging to these saturated foothills finally gave way to a little sunshine yesterday. 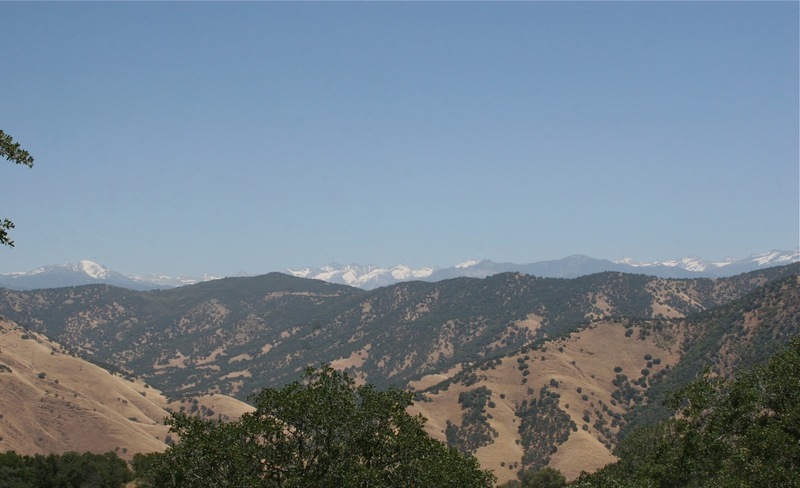 This shot of the snowpack in the Kaweahs was taken from a ridge below Sulphur Peak. I attempted the loop in Greasy to check the cows and calves and to make certain that our bulls were still home working, and to assess the condition of our roads. It’s WET, water running, dribbling, oozing everywhere. With an accumulation since December 15th, our rain gauge overflowed, holding 12 inches when completely full – a lot of rain for this country in a little over two weeks. I ran into the creek at the bottom of Sulphur, a part of the flow diverted into the road up the draw by limbs, leaves and debris that I was able to remove with a shovel and chainsaw. Remarkable runoff when one considers that the last significant rain occurred a week ago. All the stock ponds are full and running out their spillways. I couldn’t complete my loop because the pond at Grapevine was going over the dam/road, and I had to backtrack through Sulphur to get off the mountain. Despite the cold on the Kubota, it was exhilarating to see some sun and cattle. These 2006 photographs caught my eye while looking for some color here, for something other than poetry, and even these gray shots of Lemon Cove lift my spirits. The fog, clinging to these saturated hills since the New Year, drizzles today, weighs heavy on the eyes and mind. We haven’t seen our cattle for a month, haven’t got a calf branded, ground too wet to get a pickup to them. Clarence drove his Kawasaki Mule to the Paregien Ranch in the fog yesterday, choosing the cold and wet over pacing the house, to find the rain gauge full, roads sloughed and so wet, we’ll probably have to ride from Dry Creek to gather and brand them after a week or so of sunshine and no rain. I haven’t been across the creek since our Corb Lund replay of ‘The Truck Got Stuck’ New Year’s morning with the birders, my son and the neighbors, since another inch and three-quarters rain. The work is stacking-up as we begin to think about Elko, wondering how we’re going to get it all done. How good to see that the sky is still blue! We’ve logged another 1.76″ rain since New Year’s Day, extending our gray days to nearly three weeks straight. Not one to be caught complaining about rain, we spent New Year’s morning reenacting Corb Lund’s The Truck Got Stuck when I went to winch the local Audubon, on their Christmas Bird Count, out of our ‘dobe Flat – getting stuck myself, and then my son’s truck come to rescue me, breaking a chain and a cable before we were able to send them on their way as it began to pour. Bob and I, still embedded in the clay, had to enlist the good nature of our neighbors, pickups winching, leapfrogging backwards, one after another out of the bog to terra firma. Always humorous once you’re out of the mud, I emailed an audio clip of Corb’s song to Rob Hansen, group leader, who has since rewritten Corb’s lyrics to more accurately fit our landscape and circumstance. All’s well that ends well – no feeling more helpless than being stuck in the mud a long ways from the road home in the rain. Good to see the creek run, though a far cry from the 6-7,000 cfs in 1997, or the 14,000 cfs in 1969, or the estimated 20,000 cfs in 1955. 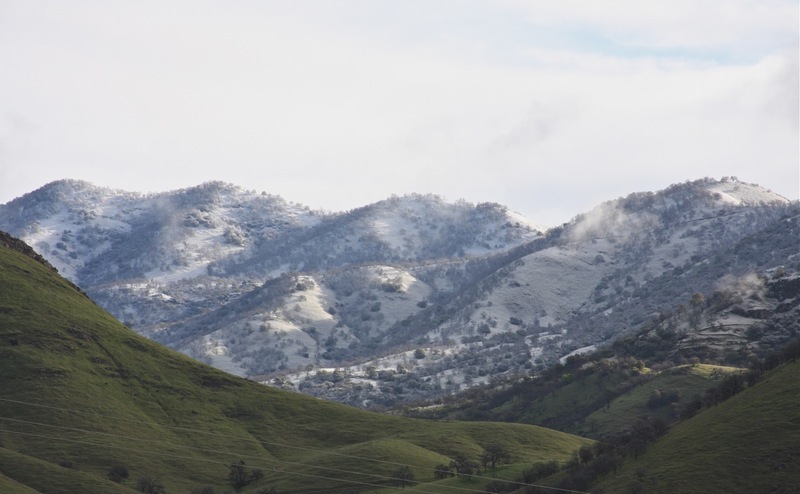 34 degrees this a.m.
.82″ overnight on Dry Creek, it’ll probably be Tuesday before we can check the gauges at the higher elevations without impacting our roads. I think we’re looking at 7″ accumulated in Greasy and Paregien Corrals over the past 3 weeks. Hope the gauges have that much capacity. Rain forecast again for Tuesday night. With nine consecutive mornings of measurable rainfall since December 15th, we’ve accumulated 6.53” of rain to bring us to 11.47” thus far this season – more rain than entire 2006-07 season, and about an inch away from the totals for the 2007-08 & 2008-09 seasons. Hearsay has it his that we’ve broken all rainfall records for this time of year, going back to the 1955 Christmas flood that I remember vividly. 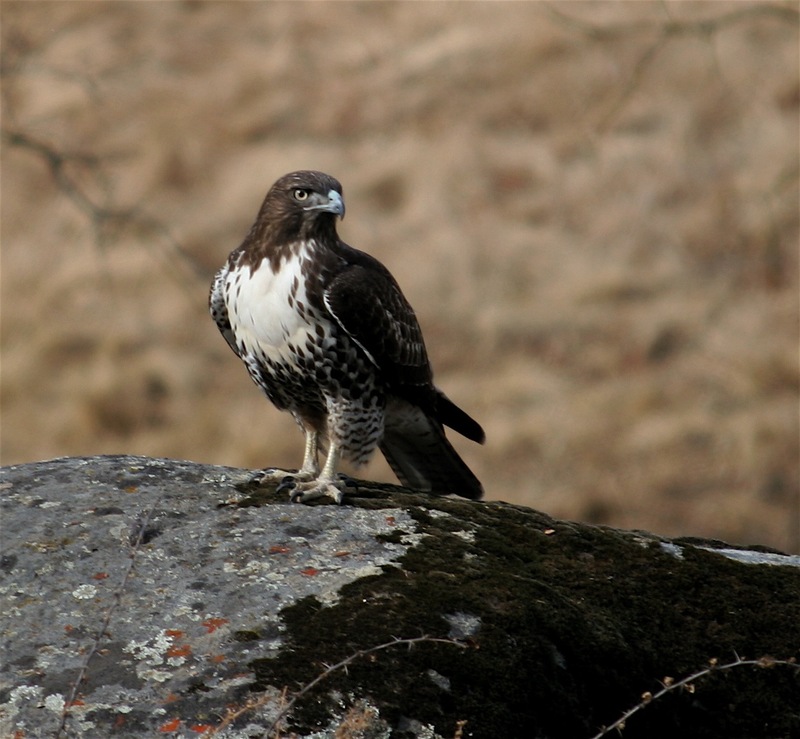 Looks like a little sun and blue sky today, a chance for the hawks and the rest of us to get our feathers dry. Fifth consecutive morning with measurable rain, now totaling 3.76″, Dry Creek peaked sometime last night (2,200 cfs), down a foot or so at daylight. The rain’s been fairly steady since Friday, but no real downpours. Mostly all running off now that the ground is full, filling stockponds. They’ve shut the Kaweah River off at Terminus Dam, letting Dry Creek have the channel. I can hear and see Dry Creek from the house for the first time this year – 1.23″ rain, cows and calves atop the ridges greening in the gray. NOAA is predicting 7-10″ rain through mid-next week (22nd), flood warnings in the foothills and 7-10′ of snow in the Sierras above 7,000′, beginning Friday with a 20% chance of rain tonight. The Pineapple Express aimed at California is hooking-up with a low spinning out of the Gulf of Alaska. We’ve received .37″ over the past 48 hours as a precursor to this event that is consistent with our 30-day cycle set up in October and November. I am expecting lower low temperatures than forecast around the 25th that may bring snow instead of rain. It’s really too wet to do much other than prepare for what’s coming. A decided weather change yesterday, our beautiful fall weather and above-normal temperatures have dropped 20 degrees with a weak storm front entering the state, bringing damp and gray. A chance of showers Tuesday and again towards the weekend. Coinciding with the 30-day weather change a week before Thanksgiving, next week should be colder and rainy, and especially cold around Christmas – perhaps even some low snow on Dry Creek. Redbud in bloom, snow below 3,000 feet, .60 inches rain and 36° at daylight. We experienced a welcome weather change with a little rain.